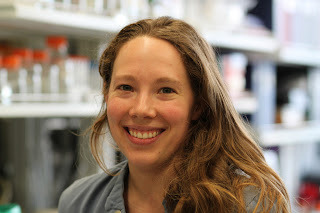 Jen Lynch is a Ph.D. student studying Immunology at Washington University since 2005. At that time, she became involved with the Young Scientist Program (YSP) as a way to continue science outreach that she had already been involved with since high school. During her years volunteering with YSP, Jen has accomplished so many things. One is enhancing the teaching team component of YSP, which goes out and performs demos at local schools, by creating and then leading the forensics teaching team. Another is serving as co-coordinator of the lab recycling efforts of YSP. Most recently, she chaired YSP's 20th Anniversary Celebration. "That was my final gift to YSP and a great way to end my years of volunteering," she says. Jen has also been directly involved with the YSP-MIDSCI partnership and is ecstatic about it. The way she describes the inception of this collaboration is that MIDSCI, as a local company, was searching for a productive and meaningful way to give back to the community, and a partnership with YSP made sense for both sides. This way, MIDSCI provides supplies such as teaching kits to YSP teachers and programs that are invaluable for the science education of St. Louis's youth. Jen is passionate about issues related to science education; regarding her future career plans, she is looking to combine her Immunology focus with science outreach by obtaining a Masters of Public Health or Policy degree and then pursuing a career in global health, translating science research for non-scientists so that they can make informed decisions about their health. "In a way, it's taking YSP's goals to a global level," Jen concludes.